Rambutan is one of the fruits I ate while traveling in the Philippines. The spikes of the reddish fruit peel are fairly soft, almost rubbery. 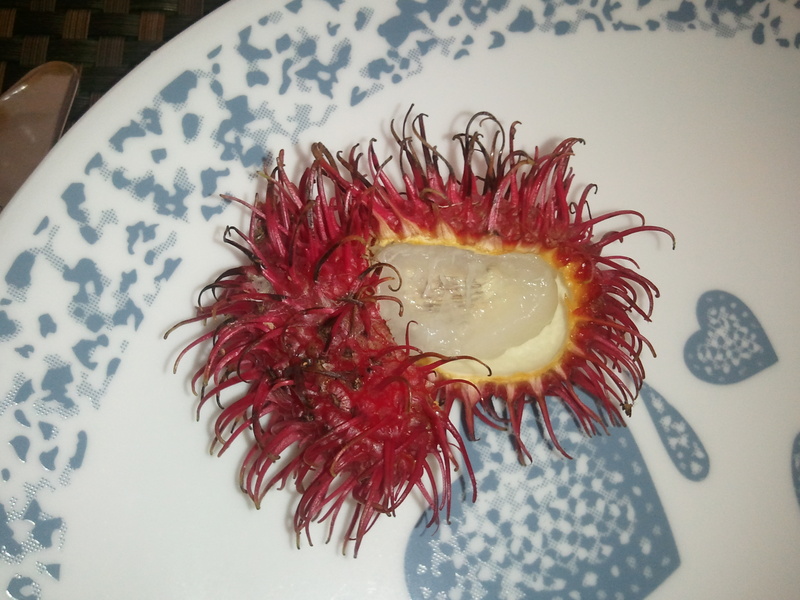 I was disappointed by Rambutan I found in the U.S. after returning from the Philippines. The ones I found in asian markets were red and brown… the kind of brown which indicates overly dry. Then pull the fruit out of the peel. In the Philippines I was taught to pop the fruit into your mouth. You chew it, but chew around the seed. Don’t chew or eat the seed. When you are done chewing around the seed, spit the seed out. It tasted similar to grapes to me. My favorite food in the Philippines was the fresh mangoes. In the United States mangoes taste horrible to me, but in the Philippines I loved them. Tasting new food is one of the best parts of traveling because I discover new things. The interesting part is that rambutan and mangoes were new experiences for me. But rambutan is something I had never heard of before… and mangoes I knew existed. I had tasted mangoes and hated them. Just looking at the rambutan I would not have guessed it was something edible. But it tastes really good. And I would not have known mangoes existed that I enjoy eating if I did not travel abroad. But because of my willingness to try foods in the Philippines I had two NEW experiences with food. So what are some of your good surprises with new foods?